Ocean Beach Holiday House is located on the east coast of NZ - 2 and a half hours north of Auckland and 35 minutes from Whangarei. Ocean Beach is renowned for its pristine white sandy beach, great surfing, many bush, beach, harbour and mountain walks plus diving for scallops, collecting mussels, fishing or just relaxing on the beach. You will often see dolphins frolicking in the bay. This beautiful area is named "The Whangarei Heads" and is a 25 minute drive from Whangarei Airport. The beach house is very spacious, architecturally designed (1/2 acre of land) and sits proudly on top of the hill, taking advantage of the beautiful views in all directions. From the kitchen bench you look down to the beach, with the Poor Knight Islands in the distance. 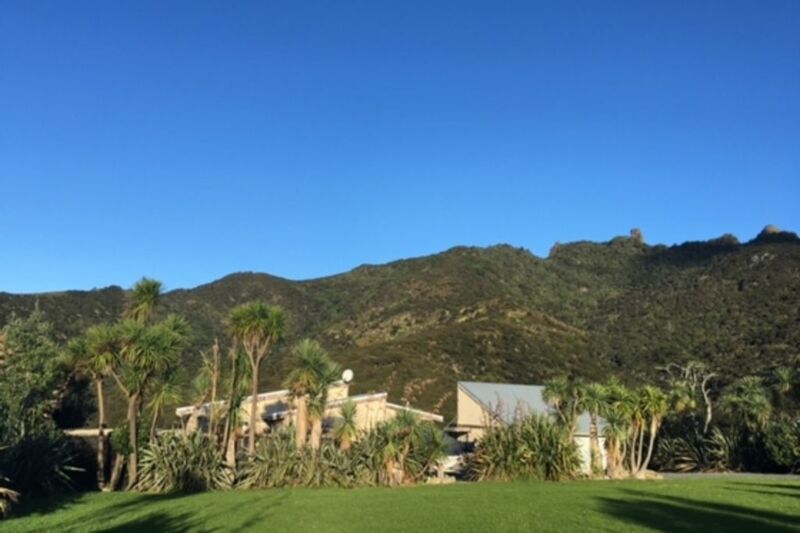 There are stunning mountains to the right, where the 'gorilla' mountain sits and you can hear the Kiwis at night roaming freely in the native bush close to the house. The main area is open plan with a fully equipped kitchen, together with serving bar with bar stools, which is a great conversation area. The dining, lounge and kitchen are situated in a large space with 3 sets of French doors all opening onto a large north facing deck running the length of the house and facing the ocean. It an easy 5 minute walk to the beach. There is also a great outdoor private area with BBQ, outdoor table that seats 10 -12 under a pergola. This is a cool area to lounge in when the days are hot and perfect for those evening BBQs. There are two hammocks and two outdoor loungers. On the main level of the beach house there are two identical private sleeping "wings" at each end of the house. Both have comfortable super king beds with separate ensuites. Each bedroom has French doors leading to a private patio. There is also a small bunkroom, ideal for children. The house is perfectly suited for 2 couples and children. Underneath the house is a comfortable sleepout with two double mattresses. There are no toilet facilities in this area. A great area for singles or teenagers. The house is warm and cozy in the winter with north facing sun streaming in from daybreak to sunset. There are heated tiles (and heated towel rails) in both the bathrooms and this heating extends out into the entranceway, acting as central heating. There is also a large garage/games room which has a pool table and dart board. This has provided loads of entertainment over the years. We ask that you respect the pool table as it is a cherished item! So please no children are allowed to play pool! Thanks for that. Your pets are welcome, just beware its a kiwi conservation area so dogs/cats must be contained on the property and not allowed to wander. It is a 5 minute drive back to Bream Head which is the entrance to the Whangarei Harbour where you have calm seas, great for launching your boat, kayaking, swimming, fishing or just relaxing with a book under a pohutukawa tree. This is a great area to take young children with safe swimming. Just keep an eye on tides, it’s best to go around the high tide (tide chart in the garage!). Please note at this stage we do not have internet. You are, however, able to access (limited) internet via 3G on your phone. Text messages and phone calls do come through. There is full 3G internet available on your phone 4 minutes away at Urquhart’s Bay. Please feel free to request an early or late check in. We are very happy to accommodate this request if its not a back to back booking. Please respect the property and leave it as you find it. Please no parties or functions. Fire bans are often in place in summer due to the reserve, so the fire-pit can only be used when there is no fire ban in place and with express permission of your hosts. The property is on tank water and self contained septic system. So please only limited toilet paper! Please ensure that coffee beans, sanitary items etc go out in the trash not down the drains. You are welcome to help yourself to coffee, tea and the basics in the cupboards. Great ocean beach home with a lovely view ! We spent 2 nights in this lovely and quiet home close to Ocean beach and we all had a very relaxing time. There is everything you need. The kids loved the garden and their bedroom. The deck was fantastic, great view, safe for the kids and plenty of space overall. The beach is less than 10mn walk and Smugglers Bay is an easy 5mn drive + 20mn walk. Something you might want to consider for future guests: the top bunk bed has no safety barrier, for big kids no problem but for younger ones it could be useful (and reassuring for the parents!). Terrific location, house was well set up and very comfortable and a great view. The house was very comfortable and catered for 7 of us, from three families easily. Beautiful decks and outdoor space. Terrific location for getting to the beach and walking. We had an amazing weekend in this lovely house on the hill above Ocean Beach. The house is great. It fitted 7 of us really easily and had everything we needed - a large and practical kitchen that was really well stocked, a comfortable living area that was big enough for us all and had lovely views to the water, 2 gorgeous bedrooms and bathrooms (and 2 bedrooms for the kids - they weren't so glamorous but fine for kids. The downstairs one was a bit dark and the upstairs one was small for 2 teenagers but they survived!) The outdoor area and garden are lovely too. We had lunch under the gazebo which was shady and cool. The big garage was great fun as it had a dart board and pool table. It's a short walk down to the beach which is beautiful - clear water and perfect waves. We went for amazing walks around the coast every morning and spent the afternoons swimming in the ocean. It's a great house and in a fabulous area. Lovely homely property near to the beach. Liz was very helpful and friendly, the property is comfortable and spacious. The property is beautiful. A great location within easy walking distance of the beach and walking tracks. The house is lovely and warm and down to earth combined with great bedrooms bathrooms and fantastic kitchen living area. Large decks and an amazing view complete this wonderful place. Great property - go more for the use of the bedrooms upstairs, it has everything you need.